Chart 322 is that of Chicago, Ill. 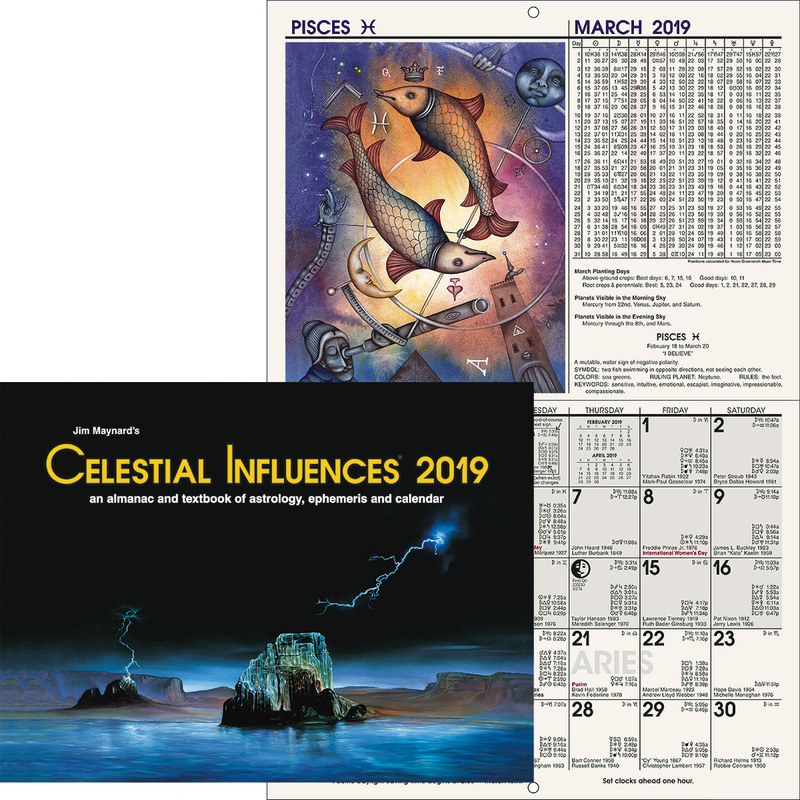 Chart 324 is that of Long Beach, Calif.
MUNDANE ASTROLOGY is the science of the influence of the heavenly bodies as they affect the world, nations, cities, communities and other groups of people. Any organization of individuals functioning under a common governing authority constitutes an entity. As such it attracts to itself fortunate and unfortunate events in a manner quite similar to that in which like events are attracted into the life of man. Both have birth charts which if known correctly map their characters; and both are influenced by picking up, radio fashion, four-dimensional vibrations through changes in their finer structures which are mapped by progressed aspects. Progressed aspects indicate the release of energies within the astral body of man that build across his four-dimensional form temporary stellar aerials. These temporary stellar aerials, so long as they function, pick up planetary energies of definite type, endow them with discordant static or pleasing harmony, and transmit them to the thought cells within the astral body at their terminals. The astral body of man is composed of thought cells, or stellar cells, as they also commonly are called. These thought cells, receiving a new supply of energy from the temporary stellar aerials, acquire unusual activity. They thus work from their four-dimensional plane to attract events into the life. According to their original composition, and the discord or harmony of the energy added to them as mapped by the progressed aspect, do they feel beneficent or malignant. To the extent they feel beneficent they work to attract fortunate events. But to the extent they feel malignant do they work to attract misfortune. The importance of the event attracted depends upon the amount of energy they acquire. These stellar cells, of which the astral body of man is composed, occupy definite compartments within his finer form, as mapped by the houses of the birth chart. The department of life to which an event attracted by a progressed aspect relates is determined by the compartment in the astral body the thought cells of which receive the additional energy. 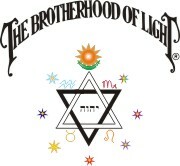 This is revealed by the house occupied by each planet involved in the progressed aspect. This whole matter is set forth in all its details in Courses X-I, Delineating the Horoscope, and X-II, Progressing the Horoscope. It is mentioned here, not to explain it, but because the individuals of a corporation, a city or a nation play very much the same part in Mundane Astrology that the thought cells within the astral body of man play in natal astrology. These individuals are thinking units within the body of the community. The community birth chart indicates the character of the community as a functioning whole. As progressed aspects form to the birth-chart and progressed planets in this community chart, thought trains are released. These link certain individuals of similar motives and ideas together in a manner that enables them, and the thought forms they generate, to perform the same function performed by a temporary stellar aerial stretching across the astral body of individual man. Through this thought chain, and those persons which thus act as receiving terminals, because they have so completely tuned in on certain planetary vibrations, additional planetary energy finds its way to various members of the community. These feel in a particular way in reference to community effort, depending upon the type and harmony or discord of their respective characters and the type and harmony or discord of the new energy thus received. According to the way they feel and think and act, in response to the new four-dimensional energy received, is the event attracted through their activities harmonious or discordant. And according to the trend of their thinking and activities is one department of community life affected instead of another. 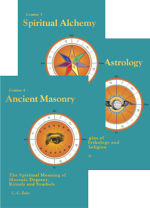 During the seven years since this Course on Mundane Astrology was first published our research department has diligently investigated the birth-charts and progressed aspects of all countries and towns for which it could obtain accurate birth data. However, the number of authentic birth charts of these larger groups which it has been able to obtain is disappointingly small. But it has not been so difficult to get the correct birth information of corporations. The result of this research work indicates that while countries and sections of countries respond more pronouncedly to Cycles and current astronomical phenomena than individuals do, that they, as well as cities and lesser corporations, are influenced much as individuals are by Major Progressions, Minor Progressions and Transits. A nation, or a section of the country, responds so pronouncedly to Cycles and current astronomical positions, that even when the birth chart of the nation is known, these should receive special consideration. But I believe that if reliance had to be placed upon only one type of influence that far greater precision could be obtained through the use of Major Progressions, Minor Progressions and Transits, than through the use of Cycles and current astronomical positions. 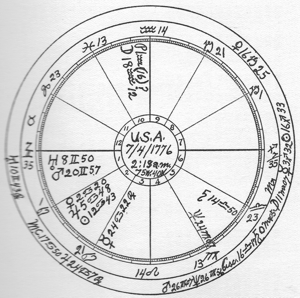 Our experience has been, although that experience has been limited by necessity in the case of nations and cities, that in predicting events for a nation, city, town or corporation, nothing else gives the details and precision that can be gained by the use of a correct birth-chart and progressed aspects. The mathematical work is identical in working progressions for these larger entities, with that used in working progressions for an individual, as set forth in Course X-II, Progressing the Horoscope. The interpretation of the progressed aspects thus ascertained deviates from that given in Course X-II, Progressing the Horoscope, only to the extent made necessary in considering a group instead of an individual. In the case of most countries and cities, however, the difficulty of obtaining a correct birth chart is so great as to prohibit their use. We are, therefore compelled to use, not what we prefer, but that which we can get. Cycles and Major Conjunctions thus give us much information as to what will happen at a specified time within a given area; but they do not clearly designate the city, or other small locality chiefly affected by the event. They do not point out the one specific enterprise, among many of a similar nature, which feels the full weight of the influence. Such details can be had only from progressions calculated to a correctly timed birth chart. Such correct birth charts are not so difficult to obtain for corporations. Particularly is this true in reference to the new corporations which are formed from time to time. The data are so fresh in the minds of those forming them that they are easily procured. And more frequently than the general public recognizes, an astrologer is called in to determine the most propitious time for launching such a corporate venture. 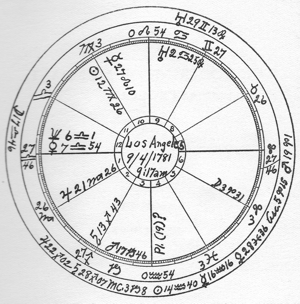 But whether to select the proper time to bring a new corporation into existence, or to be able to determine the characteristics and general fortune of one already in existence, and the event likely to be attracted by each progressed aspect that forms, it is essential that the true moment of birth be known, for which the birth chart should be erected. This raises the question as to just what marks the true moment of birth. It is customary, in the formation of a corporation, for an attorney to draw up the Articles of Incorporation, have them signed by those forming the corporation, and forward them to the proper State authority. This State authority signs the proper papers giving permission to the corporation to function according to its Articles of Incorporation. Before the corporation can thus function, however, it must formulate and adopt rules and regulations for the conduct of its affairs which are not specified in the Articles of Incorporation. Commonly a set of Bylaws has been drafted by the attorney, and after he receives the charter of the corporation, signed by the State, granting the corporation permission to function, he calls the first official meeting of the trustees or board of directors. The chief object of this first meeting is to enable the trustees or board of directors to adopt the Bylaws which shall govern them in their subsequent business and other transactions. The formation of the corporation, receiving a charter signed by the State, and the formulating of the Bylaws, all seem to me to belong to the period of gestation. The attorney acts as midwife. He delivers the State charter, Articles of Incorporation and Bylaws to the trustees or board of directors. Their signing acceptance of them is the first independent act of the corporation. As the corporation does not function, but has merely been granted privilege by the State to function, until its directors or trustees have thus signed the Bylaws, or such papers as shall govern its future activities, this act of signing acceptance by those who are to handle its affairs, seems to me to mark the true moment of birth. Assuredly there is a definite correspondence between geographic positions and celestial influences. Many years ago Albert Ross Parsons, in a book now long out of print, published a map, which used the Great Pyramid of Gizeh as a starting point from which to coordinate geographic longitude with zodiacal longitude, and thus obtain the sign and degree ruling each degree of longitude on the earth’s surface. Later, Sepharial published his Theory of Geodetic Equivalents, in which he assumes that 0 degrees longitude on the earth’s surface corresponds to 0 degrees Aries on the ecliptic, that 30 degrees longitude on the earth’s surface corresponds to 0 degrees Taurus, that 60 degrees longitude on the earth’s surface corresponds to 0 degrees Gemini, etc. These correspondences are for the midheaven of the locality. Therefore, to find the rising sign and degree, simply use the degree thus indicated on the cusp of the 10th house, and from a table of houses for the latitude of the place ascertain the sign and degree on the Ascendant when this degree is on the M.C. The geodetic M.C. of Chicago, thus obtained, for instance, is Capricorn 2—0, and the Ascendant is Aries 3—53. The M.C. 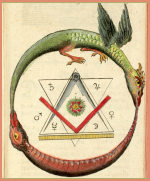 of San Francisco, following this procedure, is Scorpio 27—35, and its Ascendant is Aquarius 7—42. L. Edward Johndro points out, with apparent justification, that the rulership of areas on the earth’s surface according to the correspondence between geographic longitude and the signs and degrees of the zodiac, gradually shifts, due to the precession of the equinoxes. From pyramidal and other data, he places the correspondence of 0 degrees Aries on the M.C. as west longitude 29—10 on the earth’s surface. Paul Counsil, following rather closely the methods of Mr. Johndro, but using other data to establish the starting point, finds that 0 degrees Aries on the M.C. corresponds in 1930 to west longitude 36—42. Using this as a basic point of reference, he spreads the stars upon a map of the earth. These efforts to establish the correct coordinates between each area of the earth and its celestial correspondence are deserving of every encouragement. Even though there is still a difference of opinion as to how the coordinates should be determined, still, such coordinates must exist, and when enough research has been done, no doubt, the correct ones will get proper recognition. I feel quite sure that each area of the earth’s surface does thus have its correspondence in the sky which has an influence over it. Yet in the Hermetic System of Mundane Astrology, instead of dealing chiefly with land areas, which are stationary, we devote our attention as largely as possible to actual groups of people. In every birth chart the geographic position of the individual at the moment of his birth must be considered in erecting the chart. But after the individual has been born, the fact that he moves to some distant place is entirely subordinate in its influence over his life to the Major Progression in his birth chart which impelled him to make the move. If, therefore, it is possible to secure the actual birth chart of an individual, a corporation, a city or a nation, I am convinced this chart, erected and progressed according to the accepted method, is the best of all indices as to when, and what, events will be attracted. Yet entirely aside from such a birth chart, and aside from coordinates, practical experience indicates that the important events which are to happen within a given area are all foreshown by other astronomical relations, chiefly by the heavier aspects which have some influence over the world as a whole, and by Cyclic Charts and the Charts of Major Conjunctions erected for that area. The sign occupied by each of the major planets, and the aspects that form between these planets from time to time, have an influence over the trend of world events. Where these events chiefly will take place must be determined from the specific birth charts and progressions, or lacking these, from the Cyclic Charts, of the nations, cities and communities of the world. The whole world often is somewhat affected by a given astronomical relationship; but as a rule certain regions of the earth are much more affected than others. For instance, the discovery of the new planet, Pluto, early in 1930 was coincident with a financial depression which affected the whole world. For about seven years after its discovery Pluto was continuously afflicted by the square of the disruptive planet, Uranus, and at times also by the square of Jupiter and the opposition of Saturn. No country in the world escaped serious difficulties. But some countries were more influenced than others, and to determine where the influence would thus most pronouncedly be felt, something more than these general astronomical positions had to be known. In the birth chart of the U. S., given at the front of this chapter/lesson, Neptune, the planet of inflation, of promotion schemes, and of exaggerated expectations, is in the house of speculation (5th). Mars is the planet of energy and of over expansion. In 1929, by Major Progression, Mars, co-ruler of the people of the U. S. (1st), came conjunction Neptune r, stimulating a wild period of stock market and other speculation, in which a large part of the population took part. Any astrologer, observing this affliction in the 5th house of an individual, would have advised caution and conservatism. But typical of Mars conjunction Neptune, caution was thrown to the wind in the hope of some wonderful gain. Venus in the U. S. chart is in the house of money (2nd). By December 1929, the Moon, by Major Progression, was in the house of speculation (5th), making the perfect square to Venus r. Early November 1929, was the time the stock market broke. Mars had passed the perfect conjunction to Neptune r by only 20 minutes, and by mid-November the Moon was within one degree of the perfect square to Venus r, by Major Progression. This was the time when a vast number of people suffered financial loss. It marked the commencement of a financial depression affecting the whole world, coincident with the influence of an afflicted Pluto. Pluto at that time, by Transit, was in the 2nd house (money) of the U. S. chart, and did not permanently leave it until 1933. Thus was it shown, by the progressions in its birth chart, that the U. S. would be more affected by the general afflictions in the sky than most other countries. In the space at my disposal I cannot give historical references covering many events of wide significance which have been indicated by current astronomical positions. All I can hope to do is to point the method of research to be followed by anyone desirous of tracing the pattern of history in its various details. Merely as an example, necessarily curtailed, of what I mean, it may be noticed that before the disruptive planet Uranus moved permanently away from the aspect, it made the perfect square to Pluto five distinct times. And each time there was a shattering of precedent in America, in Europe, and in the Orient. The first square occurred April 21, 1932. In the Far East, Japan decided to acquire Manchuria by military aggression. In Europe a financial crisis arose, with open threats of bankruptcy on the part of Germany, and a possibility of revolution. In the U. S., to avert the threatened condition in Europe, President Hoover declared a moratorium on the June payments due this country, thus setting a precedent and greatly deepening the depression in the U. S. (where Pluto by Transit was still in the money house). The second square of Uranus to Pluto occurred Sept. 3, 1932. In Europe the League of Nations told Japan to get out of Manchuria. In the Far East, Japan told the League of Nations to mind its own affairs, and continued establishing herself in Manchuria. In the U. S., Bonus Marchers in Washington were fired upon, one was killed, and their shelters were burned. They were driven from Washington like starving cattle. The third square of Uranus to Pluto occurred March 8, 1933. In the Far East, Japan withdrew from the League of Nations and started an invasion of China. In Europe, Hitler became dictator of Germany, compelled the religions to make revisions to his order, and started a campaign of persecuting the Jews. In the U. S., all banks in the country were closed for about two weeks. The fourth square of Uranus to Pluto occurred Nov. 6, 1933. In the Far East, Japan, in a dispute with Russia over the Chinese Eastern Railway, threatened war. In Europe, Hitler demanded for Germany equality of armament, and thus started a war scare. In the U. S., a presidential executive order on Nov. 8, established the Civil Works Administration, and allotted $400,000,000 to employ 4,000,000 men as a relief measure. The fifth square of Uranus to Pluto occurred January 17, 1934. In the Far East the failure of the U. S. to recognize the Japanese puppet state, Manchoukuo, caused the Japanese Admiralty to state war with the U. S. is inevitable, and to ask for huge war appropriations. In Europe, Hitler defied all countries to invade German soil, and Mussolini warned that Japan is preparing for war, with Germany as a probable ally. In the U. S. strikes of major proportions developed in various areas, and the warlike attitude of Japan was answered by U. S. recognition of Russia. Lest the impression should be given that only afflictions of the planets, as they are shown for the time in the ephemeris, influence the trend of events markedly, let us consider the trine of Jupiter, the financial planet, to Saturn, the business planet, on Oct. 26, 1933. October 22, after the aspect had come within the one degree of perfect, Roosevelt in a radio address announced a managed currency program through attempting to control prices by establishing a free gold market. Oct. 24, Roosevelt ordered NRA Director Johnson to recommend prohibitive tariffs on articles whose importation hampers recovery, and Secretary Ickes allotted $6,000,000 PWA funds for All-American Canal in Imperial Valley, giving employment to 9,000 men. Oct. 25, Roosevelt ordered AAA to loan up to 4 cents a bushel on warehoused corn to farmers pledged to reduction program; and RFC set price of newly-mined domestic gold at $31.36 instead of the former standard price of $20.67 per ounce. The aspect also had a constructive influence in many other countries, depending upon the progressions operative in their charts at the time. But I believe sufficient has been said about aspects as they are shown in the ephemeris. In many countries the date of whose births are unknown, observation has caused astrologers to believe they are ruled by certain signs. When, through the observed effect of planets transiting a certain sign, or from other astronomical phenomena occurring in the sign, it becomes fairly certain of the sign ruling a country or city, the Transit of a slow-moving planet through the sign, or a Major Conjunction or other phenomena taking place in the sign, may be made the basis of determining some of the things which will happen in that country or city. The signs also rule certain departments of endeavor in the world’s affairs. And such things in general as the signs thus rule are affected by the Transit of a heavy planet through the sign. Again I have space to devote to this merely sufficient to enable me to point out to such as are interested in tracing such matters, how to proceed. What follows, therefore, is not an attempt at a full exposition, but is put forward only to give hints which may advantageously be followed. We know too little about Pluto’s influence in the past to use this most slow-moving planet in our examples. But Neptune, next slowest in motion, takes about 14 years to Transit each zodiacal sign. I shall give slight attention to its beneficial influence, and confine my observations to its well-recognized proclivity when afflicted of creating a chaotic state of affairs. As a matter of fact, such chaos frequently compels drastic steps to be taken in the direction of true progress. Neptune was in the sign Cancer from June 1902 to May 1916. Cancer rules the home and it rules the ocean. It was during this period that the submarine was developed into an instrument of practical use in warfare. It became effective during the World War. Being hidden from view, and secretive in its method of attack, it well exemplifies Neptune. Before Neptune entered Cancer, women found ample opportunity to exercise their skill and industry in the home. But not long afterward, machinery was doing nearly all of those things upon which they prided themselves. Deprived of self expression, the home became chaotic, and they began to seek employment elsewhere, entering industry in competition with men. From May 1916 to July 1929, Neptune was in Leo, the sign ruling amusements and rulership. Chaos developed as to the ruling authority. Most kings were kicked off their thrones, and in some countries, notably Russia, Turkey and Italy, dictators took their place. Moving pictures developed into the dominant form of entertainment. Yet this industry was thrown into a chaotic state, and was compelled to develop a different type of talent through the introduction of talking pictures. From July 1929 to August 1943, Neptune is in Virgo, the sign ruling agricultural produce and labor. To decrease the overabundance of agricultural produce, the U. S. in 1934, paid farmers to reduce acreage and to plough under every third row of cotton. It bought up millions of sows about to farrow and slaughtered them that their pigs might not be born. Yet in the same year unprecedented droughts turned many of the agricultural states into almost desert conditions. Throughout the world the greatest problem is that of unemployment. There were 14,000,000 unemployed in the U. S. in 1933. Next let us briefly consider Uranus, the planet of invention, of radical activities and of disruption. He takes about 7 years to pass through each zodiacal sign. From December 1904 to November 1912 Uranus was in the sign Capricorn, which rules the country, Mexico, and in business and industry rules system. During this time a revolution overthrew the government of Mexico, and the development of mass production revolutionized industry. From November 1912 to January 1920 Uranus was in the sign Aquarius, ruling Russia, and ruling the rights of man. A revolution overthrew the Russian government. The slogan of the nations winning the World War was to make the world safe for democracy. The treaties at the close of the war were based upon the rights of people to self determination as to allegiance and form of government. From January 1920 to January 1928 Uranus was in the sign Pisces, ruling restrictions, relief measures, disappointment and crime. In January 1920, the prohibition law, which was repealed in 1934, because it was believed to be responsible for developing and financing organized crime, and creating the modern racketeer and gangster, went into effect. Disappointment was expressed in nearly all countries at the failure of ideals which had been encouraged during the war. Each country also felt disappointed at what it received in the final settlement. In the U. S. relief measures were constantly before Congress, and those high in public office sold out vast holdings to corporations, and later were successfully prosecuted for bribery; the properties being recovered by the government. From January 1928 to March 1935 Uranus was in Aries, the sign ruling Germany, ruling manufacturing, and ruling military leadership. A revolution gave Germany a dictator. Japan, hitherto of minor importance, took her place as the rival of both Britain and the U.S. in manufactured products and as a naval power. From March 1935 to May 1942, Uranus will be in Taurus, ruling Ireland, and ruling the banks and money. From May 1942 to June 1949, Uranus will be in Gemini, ruling the U.S.A., and ruling newspapers and transportation. A Cycle, as used in Mundane Astrology, is a chart erected at a given locality for the moment a planet crosses the celestial equator from south declination to north declination. The Cycle of the Moon is erected for the moment when the Moon is in conjunction with the Sun. Each planet thus has its own Cycle, which governs those matters the planet rules. The planet for which the Cycle is erected, as it moves to aspects, by Transit, with the places occupied by the various planets in the Cycle Chart, indicates the time and nature of the events which takes place in the locality for which the chart was erected. The chapters/lessons which follow take this matter up in detail. The conjunction of two planets in the sky corresponds to the convergence of corresponding factors on the earth. And a chart erected for a given locality at the moment of such conjunction indicates the significance of the event thus attracted in that particular region. This also will be given detailed attention in the following chapters. In Chapter 2 (Serial Lesson 142), a list of nations and cities ruled by each zodiacal sign is given. The following is the birth data of some nations and some cities, according to the research of those who have made a special study of them. In no instance do we vouch for the authenticity. They are presented merely as the birth charts commonly used by those most conversant with Mundane Astrology. Twelve of the more important are preceded by numbers. These refer to the table at the front of the chapter/lesson, from which the positions of the signs on the houses and the planets in the signs may readily be copied, thus giving the student the birth chart of the nation or city preceded by a number without the work of making the calculations. 319. Argentine Republic, July 9, 1816, 4:00 p.m. 66W. 26S. 320. Austria; Republic of, Nov. 12, 1918, 4:00 p.m. 16E23.48N14. Barkingtown, England, Oct. 5, 1931, 12:15 p.m. L.M.T. 321. Boston, Mass., May 1, 1822, 12:01 a.m.
322. Chicago, Ill., March 4, 1837, 2:05 p.m.
323. Cleveland, Ohio, March 5, 1836, 12:01 a.m.
Ft. Myers, Fla., May 19, 1905, 11:44 a.m. L.M.T. German Republic, Nov. 9, 1918, 1:22 p.m. L.M.T. 13E. 52N. Jacksonville, Fla., May 31, 1887, 11:41 a.m. L.M.T. 324. Long Beach, Calif., Dec. 13, 1897, 10:00 a.m.
Los Angeles, Calif., Sept. 4, 1781, 9:17 a.m.
Miami Beach, Fla., May 25, 1917, 11:40 a.m. L.M.T. Orlando, Fla., July 31, 1875, 12:00 noon L.M.T. Palm Beach, Fla., Apr. 17, 1911, 11:39 a.m. L.M.T. Pensacola, Fla., Dec. 5, 1825, 12:01 p.m.
327. Spanish Republic, Apr. 14, 1931, 4:45 p.m.
St. Augustine, Fla., Dec. 28, 1824, 12:01 p.m.
Tampa, Fla., Dec. 15, 1855, 11:37 a.m.
328. Toronto, Ont., Canada, March 6, 1834, 5:15 a.m.
329. U.S.A. Chart as used by C. E. James, July 4, 1776, 5:00 p.m., Philadelphia, Pa. Chart of U.S.A. used by us is given at front of chapter/lesson, July 4, 1776, 2:13 a.m., Philadelphia. 330. Virgin Islands, U. S. A., March 31, 1917, 4:33 p.m. 65W. 18N20. West Palm Beach, Fla., Nov. 5, 1894, 11:39 a.m. L.M.T. Winnipeg, Man., Canada, Nov. 8, 1873, 4:00 p.m. The following is not an attempt to prove that the birth charts of nations and cities as here given are correct. It merely gives the dates of a few outstanding events, and the Major Progressions at the time in the charts here given. This is to indicate to the student of Mundane Astrology the method to be followed in his work, and what he may expect from progressed aspects. Major Events are attracted to a nation or a city ONLY when there is a Major Progressed Aspect within one degree of perfect which relates by house position to the department of life affected. Furthermore, even as in natal astrology, Minor Progressed Aspects attract Minor Events, and Aspects by Transit attract Inconsequential Events. These lesser progressions do not attract Important Events, but by adding accessory energy to Major Progressed aspects may precisely time Important Events. In the following examples, unless otherwise expressly stated, all aspects mentioned are Major Progressed Aspects. Chart 319 is that of the Argentine Republic. Sept. 6, 1930, the president having been forced to resign a few days earlier, the vice president also resigned, and the Military Assembly took possession of the government: Jupiter, ruler of 1st (people), had been square Saturn p, ruler of 2nd (money) a number of years, and discontent had arisen over the handling of finances. Mars, ruler of 12th (secret enemies), conjunction Jupiter r, ruler of 1st (people). Sun, ruler of 7th (open enemies), semisextile Uranus r in 12th (secret enemies). Mercury, ruler of 10th (administration), square Venus r in 7th (open enemies). Chart 320 is that of the Republic of Austria. In the summer of 1934 revolution broke out; Asc. opposition Venus p, ruler of the 1st and 7th. Venus inconjunct Pluto r, shows the split into strong conflicting factions; and Mars in 9th (religion) sesquisquare Saturn r, is responsible for religion entering the conflict. Foreign powers aided the revolutionary movement; Sun conjunction Mercury in 7th (foreign nations). The sesquisquare of Mars to Saturn r, ruler of 10th (governing authority), brought an attempt to overthrow the government, and accomplished the assassination of its dictator, Englebert Dollfus, on July 25, 1934. Chart 321 is that of Boston, Mass. The Great Fire took place Nov. 9-10, 1872. Jupiter, ruler of the 4th (buildings), had progressed to the square of Mars r (fire). Mars (fire) was sesquisquare Saturn r, ruler of 1st (people). Venus, inconjunct Mars in the birth chart, was in the 4th (houses), trine Mars p (fire). The Police Strike, the settlement of which by Calvin Coolidge, then governor, gave him national recognition for his manifesto that, “There is no right to strike against the public safety by anybody, anywhere, any time,” was Sept. 9, 1919: Mercury, ruler of the 6th (labor and police), semisextile Mars r in 7th (war); Sun sextile Mars p (strife), ruler of 10th (employers); Mars inconjunct Jupiter r, ruler of 12th (crime); Saturn conjunction Sun r.
In the birth chart Mars is in the 1st, conjunction Jupiter and opposition Neptune. At the time of the Great Fire, Oct. 8-10, 1871, Mars, after being retrograde had again reached the conjunction Jupiter r; and Venus, ruler of 4th (houses), was trine Mars r and sextile Neptune r, thus adding new energy to the heavy opposition in the birth chart. May 4, 1886, following a strike there were serious Anarchist Riots: Mars (strife), ruler of 1st (people), square Saturn p, ruler of 6th (labor). 1893, World’s Columbian Exposition put Chicago on the map as a city of unusual business enterprise: Sun in 10th (business and honor), square Jupiter r in 1st (people). 1933, Century of Progress Exposition brought a record attendance; Jupiter in 1st (people) had been trine M.C. r (honor) for some years. Mercury, ruler of 7th (other people), was sextile Jupiter p. Mercury was retrograde in motion and still closely sextile Jupiter p in 1934. The fair was continued that year, with vast throngs in attendance. Chart 323 is that of Cleveland, Ohio. At the time of the serious labor difficulties and strikes of 1934, the Sun was sextile Venus r, ruler of 6th (labor), and was sesquisquare Saturn r, ruler of 2nd (wages). In the birth chart the Sun is heavily afflicted by the conjunction of Mars and the opposition of Neptune. Pluto is in the 4th (lands and buildings), and at the time of the earthquake, March 10, 1933, the Sun was exactly sesquisquare Pluto p. There was great damage to buildings. The Moon (many people) is in the 7th, but is ruler of the 6th (illness). Mars (violence) was exactly inconjunct Moon r. Many persons were injured. Mercury, ruler of 8th (death), was square Jupiter in 8th (death). There was heavy loss of life. Finally, the Moon by Major Progression, had moved into the 10th, in sextile to Sun r. This gave the matter wide publicity, and the good aspect thus made by the Moon brought prompt and efficient relief to the many people who were in distress. The Chart of Los Angeles is given at the front of this chapter/lesson. 1805—Locust pests destroy crops: Sun conjunction Neptune r in 12th (pests). Moon probably conjunction Pluto in 4th (crops on the ground). 1806—Indians taught to grow hemp: Sun, ruler of 10th (employers), conjunction Venus r (people). Mars, ruler of 6th (servants), trine Mercury in 10th (business). 1815—Floods: Mars on 4th (weather), opposition M.C. r (business). 1817—First record of a school in Los Angeles: Jupiter, co-ruler of 5th (schools), square Mercury r.
1825—Greater floods: Mars in 4th (weather), trine Venus, ruler of 1st (people). Mars is square Venus in birth chart. Elections were held, but thrown out as illegal: Mercury, ruler of 9th (law), sextile Sun r, ruler of 10th (administration). 1830—Elections again thrown out: Sun square M.C. r (government); Mercury, ruler of 9th (law), sesquisquare Moon r in 6th (laborers). 1847—Stockton arrives and there occurs near Los Angeles the Battle of San Gabriel River, resulting in the defeat of Mexican forces, Jan. 8. Los Angeles is again taken Jan. 10, signing articles of capitulation Jan. 13, 1847: Sun ruler of 10th (government), sesquisquare (agitation), Uranus r (disruption). Sun sextile Mars r, ruler of 7th (war). Venus, ruler of 1st (people), trine Mercury r in 10th (government). 1851—First newspaper in Los Angeles: Sun conjunction Jupiter r, ruler of 3rd (newspapers); Venus in 3rd (newspapers), opposition Uranus r in 9th (publishing). 1868—First bank opened in Los Angeles: Sun in 2nd (banks), sextile Jupiter p, ruler of 1st (people). 1934 Nov. 25th; street car strike: Mercury, ruler of 10th (employers), semisquare (friction), Moon r in 6th (employees). Mercury sextile Mars p, ruler of 3rd (railways), in 7th (war). There was much violence. Mr. C. E. James, who has made extensive research, believes the time for the U. S. chart should be 5:00 p.m. His chart is given in the table as No. 329. Examples that follow are for July 4, 1776, 2:13 a.m., the chart I have used since 1908, which is given at front of this chapter/lesson. 1807—Aaron Burr, intending settlement of Western lands or invasion of Mexico, leads conspiracy and is tried for treason: Mars, ruler of 12th (conspiracy), conjunction Sun r, ruler of 4th (lands). June 18, 1812—War of 1812, ostensibly over violation of rights of neutral trade and impressment, but also with desire of repressing Indians through acquisition of Canada: Jupiter ruler of 7th (war), conjunction Sun r, ruler of 4th (lands); Venus conjunctions Sun p in 4th (lands; Sun semisquare Venus r, ruler of 6th (laborers); Mars (strife), square Saturn r, ruler of 9th (shipping). Dec. 2, 1823—Monroe Doctrine declares America not subject to settlement by European powers: Sun, ruler of 4th (lands), in 4th (lands), semisquare Sun r.
1832—Oregon trail for settlement of Oregon: Mercury in 4th (lands), semisquare Mercury r in 3rd (trail or road). Black Hawk War: Sun in 4th (lands of Indians wanted by Whites), sextile Jupiter r in 7th (war). May 13, 1846—War with Mexico, resulting in acquiring western territory; Texas annexed previous year: Sun, ruler of 4th (territory), square Mars r (strife); Sun, ruler of 4th (territory), sextile Jupiter p, ruler of 7th (war). Jan. 24, 1848—Gold discovered in California: Jupiter in 2nd (cash), sextile Mars r in 1st (people), square Saturn p (planet of mining). This starts a vast throng traveling west: Mercury, ruler of 3rd (travel), sextile Mars p in 3rd (travel). 1849-50-51—Boom days in western gold fields: Sun conjunction Neptune r (booms), in 5th (speculation). Apr. 19, 1861—First blood of Civil War: Sun square Jupiter r, ruler of 7th (war); Mercury, ruler of 1st (people), in 6th (slaves), sesquisquare Uranus p in 1st (people), Mars in 4th (territory), opposition (separation), Pluto(?) r (cooperating factions), in 10th (government). Apr. 20, 1871—Ku Klux Act is passed giving civil and political rights to Negroes: Sun conjunction Saturn r, ruler of 9th (laws); Venus, ruler of 6th (inferiors), trine Venus r, ruler of 12th (secret societies). Sept. 18, 1873—Panic starts, causing several years’ depression: Sun in 2nd (money), trine Pluto (?) r in 10th (business); Venus trine Venus r in and (money); M.C. (business), square Moon r, in 10th (business). June 27, 1893—Commercial panic is started: Sun trine Jupiter r in 2nd (money); Mercury square Pluto (?) r in 10th (business); Sun sesquisquare Venus r in 2nd (money), M.C. (business), connection Uranus r (disruption). Apr. 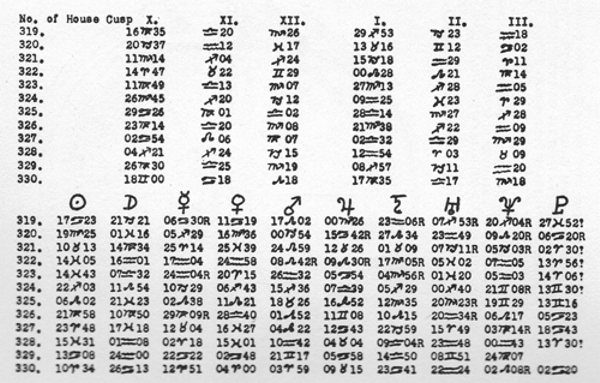 25, 1898—War with Spain: Sun inconjunct Uranus p in 1st (people); Sun semisquare Neptune p; Mars (strife), square Asc. r (people); Jupiter, ruler of 7th (war), conjunction Mercury r, ruler of 1st (people). Apr. 6, 1917—U. S. enters World War: Mercury inconjunct Uranus p, ruler of 1st (people); Mars (strife), inconjunct Moon r in 10th (government); Jupiter, ruler of 7th (war) , conjunction Mercury r, ruler of 1st (people). March 8—Currency inflation of 3 billion dollars promised by administration, scrip plan abandoned: Moon, ruler of 2nd (money), semisquare Neptune p (inflation), and Mars p in 5th (speculation). Apr. 12—Two billion dollar farm mortgage relief and refinance bill passes house; Roosevelt’s congressional message asks 2 billion dollars for home owners’ Mortgage relief: Moon, ruler of 2nd (money), trine Sun r, ruler of 4th (homes and farms). June 9—National Recovery Act passes senate, suspending antitrust laws, giving President power to alter tariffs: Moon semisextile Saturn r, ruler of 8th (tariffs), and 9th (laws). Aug. 1—NRA blanket code, regulating hours of labor, wages, and prices of goods proclaimed effective throughout nation: Moon, ruler of 2nd (prices and wages), in 6th (labor), square Pluto r (NRA) in 10th (business). Sept. 14—R.F.C. offers billion for bank stock investment in NRA industrial credit plan: Moon sextile Venus p in 8th (debts), Moon sesquisquare Venus r in 2nd (banks), Moon semisextile Sun p in 7th (borrowers). Oct. 9—Johnson recommends price fixing in retail grocers’ and similar codes: Moon, ruler of 2nd (price), square Moon r in 10th (business), from 6th (groceries). Dec. 15—Roosevelt orders navy to check liquor smugglers: Moon, ruler of 10th (administration), inconjunct Mars (liquor), ruler of 12th (smugglers). Sept. 4, 1781 9:17 A.M.
March 10, 1933, the date of the earthquake. Sun in 4th (lands and buildings), sesquisquare (agitation) Uranus p (planet of disruption). Venus in 5th (schools), square (obstacle) Saturn p, ruler of 4th (buildings): Damage was chiefly confined to schoolhouses, most of which had to be torn down and replaced, presenting an obstacle to children (5th) going to school. M.C. (business) square (obstacle) Moon r in 6th (tenants): Tourists (tenants) feared to come to the city, presenting an obstacle to business. Major Progressions in outer circle are for March 5, 1933, the date when all banks in the country were closed due to a financial crisis: M.C. in 2nd (banks) inconjunct Moon r in 10th (credit). Asc. conjunction Saturn r in 5th (hazards), ruler of 8th (debts and taxes) people unable to pay were permitted to defer paying taxes and other debts. Sun semisextile Venus p, ruler of 2nd (wages) and 6th (labor) and Mars-Neptune trine Pluto r (co-operation): administration set in motion New Deal (Pluto) for labor through enforcing shorter hours and increased pay.